This is a wonderful DIY project. Jillee at One Good Thing has a recipe for two different types of gel air fresheners: one using water and essential oils and the other using liquid potpourri. These are so much better than chemical-laden commercial air fresheners! I LOVE the water and essential oils version! This version has so many scent variations that are light and not cloying. However, I’m not a big fan of potpourri in general, so this is just personal preference. 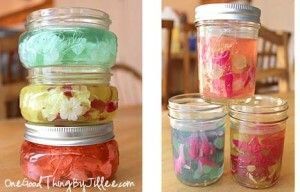 Both of the homemade gel air fresheners are visually attractive too. Click on the Make Your Own Gel Air Fresheners link below to see these great, natural air fresheners.